Making my way to Twickenham stadium on Friday I could sense how different this occasion was compared to other England games I have been to. Some of the usual stalwarts were about but there were many people for whom Twickenham was a new experience. Rather than the groups of friends meeting up as they regularly do at Six Nations or Autumn Internationals, there were families and couples taking in the atmosphere of pre-match Twickenham and there was a air of anticipation before the opening ceremony. England’s recent innovation of walking the last 50 metres or so to their changing room has seen supporters 10 or 15 deep lining the route, but Friday saw the crowd 30 or maybe 40 deep trying to get a look at the players. I was fortunate to have been a guest of World Rugby for the opening game and the hospitality areas in The Spirit of Rugby had been given a makeover. Gone were the formal tables laid out for a three-course lunch and in their place were armchairs and sofas with drinks and bowls of food being circulated by waiting staff, and more available at buffet stations. The great and the good from rugby had been invited along with Princes William and Harry plus Catherine and David Cameron, along with a number of celebrities that may or may not have had a connection with the game. World Rugby Vice-chairman Oregan Hoskins said a few words followed by RFU President Jason Leonard then it was time to make our way to our seats. The opening ceremony started about 15 minutes before it went live on TV and it the giant ball breaking the ground was an impressive sight. Laura Wright came on and led the crowd in singing a rousing version of Jerusalem, during which I found it difficult not to get emotional. Then Will Greenwood came on to warm the crowd up with Sweet Caroline and the show started. It was effective, got across the important messages, and it wasn’t too long. I was in New Zealand for the opening game of the 2011 World Cup and my memory is that it was quite a bit longer and had a sailing theme for which Auckland is famous. I looked back at some pictures I took at the time and there is a giant RWC Trophy and I remember Jonah Lomu coming on towards the end (click here for the blog article I wrote at the time). Then it was time for the game but not before the loudest national anthem I have ever heard at Twickenham followed by an equally loud rendition of Swing Low! 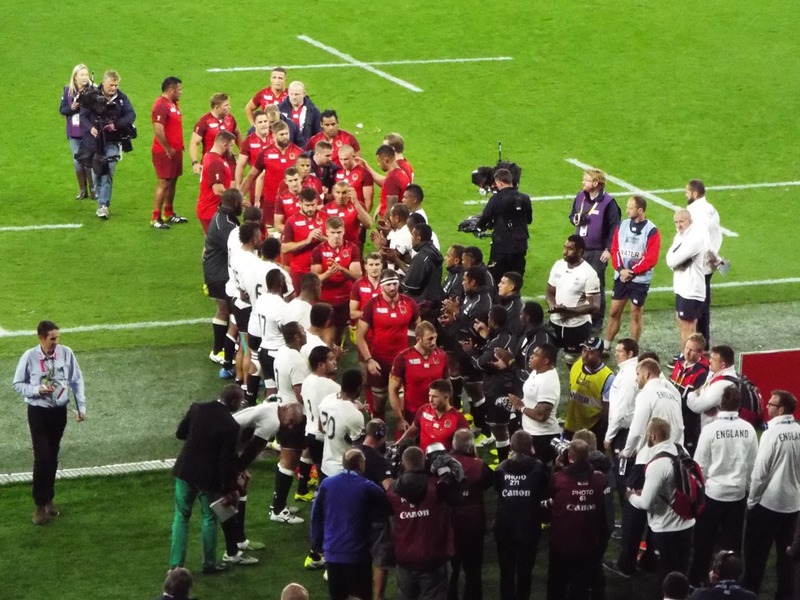 You can read about the game itself in numerous places on the internet but despite the win there was predictable criticism of England’s performance in the press and on social media. My view is that World Cups are not generally won by teams playing open, attractive rugby. England secured a bonus point win without suffering any injuries which has proved to be all the more significant after the enthralling weekend of rugby that followed. Georgia’s victory over Tonga set the tone before Japan completely upset the odds after their exhilarating win over South Africa, but Wales suffered four more injuries during a fairly ordinary performance against Uruguay. Argentina were ahead with an hour gone against the All Blacks and even prevented them from scoring a bonus point fourth try. In that game I was particularly impressed with Wayne Barnes for not going to the TMO too often and having faith in his own decisions, something that was missing in some other games. As I walked out of the stadium members of The Pack were prominent and it was good to have a chat with a number of them that I had met at interview or at training. 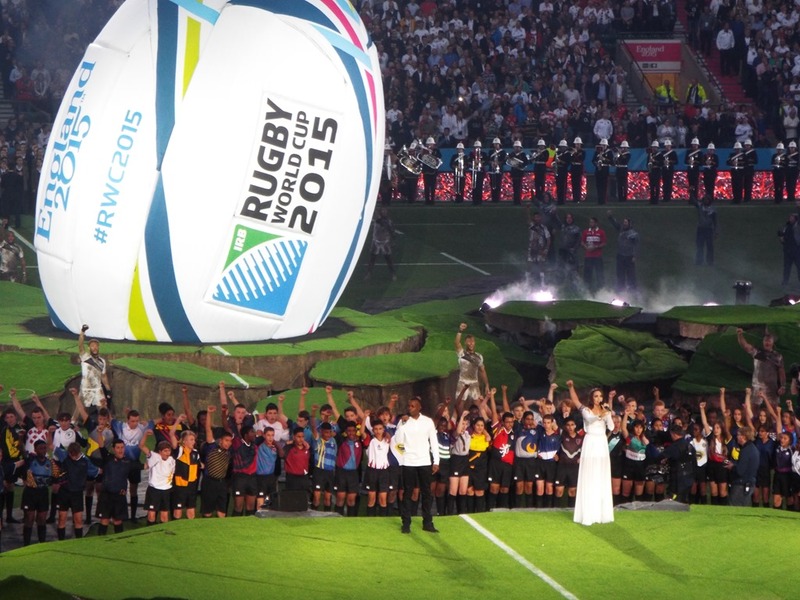 Without exception they were very excited to be a part of RWC 2015. The journey back to my Heathrow hotel was straightforward with free buses laid on as there were to other destinations. Someone falling onto the track at Twickenham station (thankfully no serious injury sustained) reminded me of the chaos in Auckland as ten of thousands of fans, including me, trying to get to Eden Park for the opening game in 2011 were stranded for 90 minutes or more as the transit system failed to cope with the numbers. I have been glued to the TV all weekend and I’ve a feeling that it will be the same story for the next six weeks.